Samir Saleh Abdullah (Arabic: سامر صالح عبد الله‎; 14 April 1969 – 20 March 2002), more commonly known as Ibn al-Khattab or Emir Khattab (also transliterated as Amir Khattab and Ameer Khattab, meaning Commander Khattab, or Leader Khattab), was a Saudi Arabian-born leader in the First Chechen War and the Second Chechen War. The origins and real identity of Khattab remained a mystery to most until after his death, when his brother gave an interview to the press. He died on 20 March 2002 following exposure to a poisoned letter delivered via a courier who had been recruited by Russia's Federal Security Service. Khattab was born in Arar, Saudi Arabia and of partial Circassian origin. At the age of 18, Khattab left Saudi Arabia to participate in the fight against the Soviet Union during the Soviet invasion of Afghanistan. During this time, he permanently incapacitated his right hand and lost several fingers after an accident with improvised explosives. The injury was treated with honey by Khattab on himself. Khattab, while the leader of Islamic International Brigade, publicly admitted that he spent the period between 1989 and 1994 in Afghanistan and that he had met Osama Bin Laden. In March 1994, Khattab arrived in Afghanistan and toured fighter training camps in Khost province. He returned to Afghanistan with the first group of Chechen militants in May 1994. Khattab underwent training in Afghanistan and had close connections with al-Qaeda. Several hundred Chechens eventually trained in al-Qaeda camps in Afghanistan. Armenian sources claim that in 1992 he was one of many Chechen volunteers who aided Azerbaijan in the embattled region of Nagorno-Karabakh, where he allegedly met Shamil Basayev. However, the Azerbaijani Ministry of Defense denied any involvement by Khattab in the Nagorno-Karabakh war. From 1993 to 1995, Khattab left to fight alongside Islamic opposition in the Tajikistan Civil War. Before leaving for Tajikistan in 1994, al-Khattab gave Abdulkareem Khadr a pet rabbit of his own, which was promptly named Khattab. In an interview, Khattab once mentioned he had also been involved in the War in Bosnia and Herzegovina. The fragment of this interview in which he makes this statement can be found in the 2004 BBC documentary The Smell of Paradise, though he did not specify his exact role or the duration of his presence there. According to Khattab's brother, he first heard about the Chechen conflict on an Afghan television channel in 1995; that same year, he entered Chechnya, posing as a television reporter. He was credited as being a pioneer in producing video footage of Chechen rebel combat operations in order to aid fundraising efforts and demoralize the enemy. During the First Chechen War, Khattab participated in fighting Russian forces and acted as an intermediary financier between foreign Muslim funding sources and the local fighters. To help secure funding and spread the message of resistance, he was frequently accompanied by at least one cameraman. His units were credited with several devastating ambushes on Russian columns in the Chechen mountains. His first action was the October 1995 ambush of a Russian convoy which killed 47 soldiers. 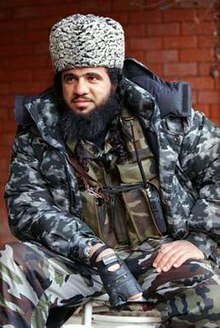 Khattab gained early fame and a great notoriety in Russia for his April 1996 ambush of a large armored column in a narrow gorge of Yaryshmardy, near Shatoy, which killed up to 100 soldiers and destroyed some two or three dozen vehicles. In another ambush, near Vedeno, at least 28 Russian troops were killed. . In the course of the war, Shamil Basayev became his closest ally and personal friend. He was also associated with Zelimkhan Yandarbiyev, who gave Khattab two of the highest Chechen military awards, the Order of Honor and the Brave Warrior medal, and promoted him to the rank of general. A senior Chechen commander by the name of Izmailov told press how Khattab urged restraint, citing the Koran, when at the end of the war the Chechens wanted to shoot those they considered traitors. After the conclusion of the war, Khattab, by then wanted by Interpol on Russia's request, became a prominent warlord and commanded the Arab Mujahideen in Chechnya, his own private army with a group of Arabs, Turks and other foreign fighters who had come to participate in the war. He set up a network of paramilitary camps in the mountainous parts of the republic that trained not only Chechens, but also Muslims from the North Caucasian Russian republics and Central Asia. On 22 December 1997, over a year after the signing of the Khasav-Yurt treaty and the end of the first war in Chechnya, the Arab mujahideen and a group of Dagestani rebels raided the base of the 136th Armoured Brigade of the 58th Division of the Russian Army in Buinaksk, Dagestan. In 1998, along with Shamil Basayev, Khattab created the Islamic International Peacekeeping Brigade (IIPB) group (also known as the Islamic Peacekeeping Army). In August–September 1999, they led the IIPB's incursions into Dagestan, which resulted in the deaths of at least several hundred people and effectively started the Second Chechen War. A Federal Security Service of the Russian Federation (FSB) investigation named Khattab as the mastermind behind the September 1999 Russian apartment bombings. However, on 14 September 1999, Khattab told the Russian Interfax news agency in Grozny that he had nothing to do with the Moscow explosions; he was quoted as saying, "We would not like to be akin to those who kill sleeping civilians with bombs and shells." However, some western journalists and historians claimed without hard evidence that the bombings were in fact a "false flag" attack perpetrated by the FSB in order to legitimize the resumption of military activities in Chechnya. Among them are Johns Hopkins University scholar David Satter, historians Yuri Felshtinsky , Amy Knight and Karen Dawisha, and former FSB officer Alexander Litvinenko who was believed to be poisoned by Russian agents in London. During the course of the war, Khattab participated in leading his militia against Russian forces in Chechnya, as well as managing the influx of foreign fighters and money (and, according to the Russian officials, also planning of attacks in Russia). He led or commanded several devastating attacks, such as the mountain battle, which killed at least 84 Russian paratroopers, and the attack on the OMON convoy near Zhani-Vedeno, which killed at least 52 Russian Interior Ministry troops. "Khattab was falsely reported dead when Guantanamo captive Omar Mohammed Ali Al Rammah faced the allegations that he witnessed Khattab being killed in an ambush in Duisi, a village in the Pankisi Gorge of Georgia on 28 April 2002." Khattab later survived a heavy-calibre bullet wound to the stomach and a landmine explosion. He was killed during the night of 19–20 March 2002, when a Dagestani messenger hired by the Russian FSB gave Khattab a poisoned letter. Chechen sources said that the letter was coated with "a fast-acting nerve agent, possibly sarin or a derivative". The messenger, a Dagestani double agent known as Ibragim Alauri, was turned by the FSB on his routine courier mission. Khattab would receive letters from his mother in Saudi Arabia, and the FSB found this to be the most opportune moment to kill Khattab. It was reported that the operation to recruit and turn Ibragim Alauri to work for the FSB and deliver the poisoned letter took some six months of preparation. Alauri was reportedly tracked down and killed a month later in Baku, Azerbaijan on Shamil Basayev's orders. Ibn Al-Khattab was succeeded by Emir Abu al-Walid. "Khattabka" (хаттабка) is now a popular Russian and Chechen name for a homemade hand grenade. According to Fawaz Gerges who cited Abu Walid al Masri's diaries, Ibn al-Khattab and Osama bin Laden operated separate groups, as they defined the enemy differently, but tried to pull each other to their own battle plans. A part of bin Laden's interest was trying to obtain dirty bombs from the Russian arsenal through al-Khattab's contacts. According to Richard A. Clarke, "Bin Laden sent Afghan Arab veterans, money, and arms to fellow Saudi ibn Khatab in Chechnya, which seemed like a perfect theater for jihad." ^ Muhammad al-`Ubaydi. "Khattab" (PDF). Combating Terrorism Center. Archived from the original (PDF) on 14 August 2015. Retrieved 5 March 2015. ^ "Khattab, the man who died for the cause of Chechnya". Islam Awareness. Retrieved 20 May 2015. ^ Paul J. Murphy (2004). The Wolves of Islam: Russia and the Faces of Chechen Terror. Brassey's. p. 35. ISBN 978-1-57488-830-0. ^ QE.I.99.03. ISLAMIC INTERNATIONAL BRIGADE (IIB) Archived 14 May 2011 at the Wayback Machine "Security Council Committee established pursuant to resolution 1267 (1999) concerning Al-Qaida and the Taliban and Associated Individuals and Entities"
^ "Chechen Fighter's Death Reveals Conflicted Feelings in Azerbaijan". EurasiaNet. Retrieved 20 May 2015. ^ "Terror in Karabakh: Chechen Warlord Shamil Basayev's Tenure in Azerbaijan". The Armenian Weekly On-Line: AWOL. Archived from the original on 14 February 2007. Retrieved 15 February 2007. ^ "BBC Four - The Smell of Paradise". YouTube. Archived from the original on 9 October 2015. Retrieved 3 March 2015. ^ "BBC News | EUROPE | Khatab: Islamic revolutionary". ^ Murphy, Paul (2004). The Wolves of Islam: Russia and the Faces of Chechen Terror. Potomac Books Inc. p. 106. ISBN 978-1-57488-830-0. ^ "Finally, We Know About the Moscow Bombings". The New York Review of Books. 22 November 2012. ^ Putin's Kleptocracy: Who Owns Russia?, By Karen Dawisha, 2014, Simon & Schuster, page 222. ^ OARDEC (26 May 2006). "Unclassified Summary of Evidence for Administrative Review Board in the case of Al-Rammah, Omar Mohammed Ali" (PDF). United States Department of Defense. pp. 25–27. Archived from the original (PDF) on 26 February 2008. Retrieved 8 January 2008. The detainee was captured in a violent road ambush by Georgia Security Forces in Duisi, Georgia [ka] on 28 April 2002. ^ "More of Kremlin's Opponents Are Ending Up Dead". The New York Times. 21 August 2016. ^ Ian R Kenyon (June 2002). "The chemical weapons convention and OPCW: the challenges of the 21st century" (PDF). The CBW Conventions Bulletin. Harvard Sussex Program on CBW Armament and Arms Limitation (56): 47.